This should be right up your alley! The chance to summarise everything you know about your Gleeson ancestry so that it can be published as a blog post here on this website. Or so that you can bring it along to the Gathering as a poster (where we will hang it up on the walls of the Scouts' Hall). Or simply so that you can talk about it with other people at the event. Either way, sharing this with other people could help you break through some of your Brick Walls in your Gleeson research. Below are a few suggestions for the sort of topics and questions that you could address. The two most important pieces of information about your Gleeson family are 1) what townland did they come from? and 2) did the family have a nickname? Knowing the townland will help identify neighbouring Gleeson families that could vey well be related to you. Knowing the family nickname will also tie you to other families with the same nickname, and these families are likely to be your close cousins and a little bit more digging might establish a firm paper trail connecting your two families. So here are the questions. Have a go at answering them and see how far you get. 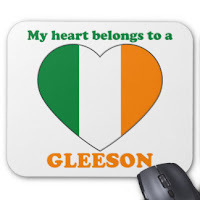 If you're happy with what you've written, send it to gleesonclan2016@gmail.com (along with a few photos if you have them) and we will draft a blog post and publish it for you here on this website. You can also look into developing it as a poster which you can bring along with you to the gathering. 1) What townland did your Gleeson family come from? 2) Did your family have a nickname (like Gleeson Cooper, or Gleeson Fira, etc)? 4) Who were his children and what was their exact birth order? 5) Do you have a 3-4 generation family tree chart for your earliest known ancestor and his descendants? If so, include a jpeg or pdf version of it in your report. 6) What happened to your Gleeson family? did they emigrate? why (or why not)? 7) What did your Gleeson family do? Were there any notable characters in the family? Did any of them have a "brush with history"? 8) What mysteries exist within the family history and which ones are you hoping to solve at some stage?